Dial is certainly philosophical about the world’s shortcomings and committed to representing the different perspectives that make up historical reality. Dial is certainly philosophical about the world’s shortcomings and committed to representing the different perspectives that make up historical reality. “Most things We look at got at least two sides,” he asserts. But despite What might be Dial’s efforts to be objective, he never lets humanity off the hook. And so it was with a sense of warning and admonition that he created a darkly humorous five-part piece on the global oil crisis titled Driving to the End of the World. A discourse on our reckless consumption of the earth’s oil reserves, this series of works captures the metaphoric vision of the world speeding down the road to its own self-destruction. The pieces were inspired by Dial’s discovery of an abandoned truck body from the late 1940s or ’50s that was decomposing in the woods surrounding his property. 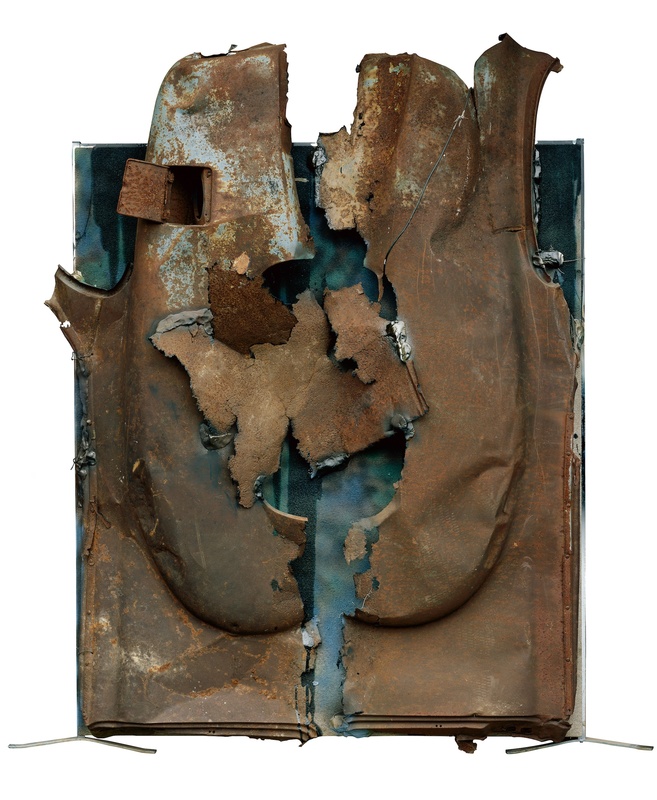 Dissecting the already crumbling carcass, he took its various parts and resorted them into his art—the rusty, bulging side panels of the pickup comprise one abstraction, While the twisty spring coils from its cab seats form another. In total, Dial created four of these wall reliefs. 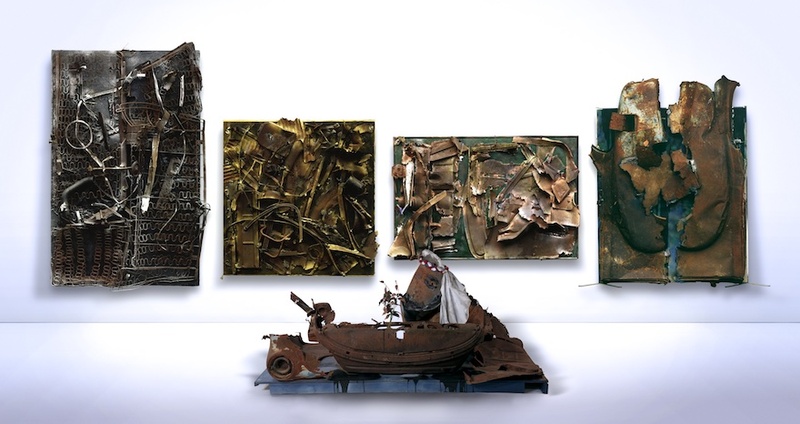 Joining them is a floor assemblage of a figure that he calls the “oil man,” an Arab sheik who is seated with a bouquet of graveyard flowers in a boat—half oil freighter, half funerary barge-fashioned from the truck’s corroding dashboard.